HTC can stand for whatever you want! 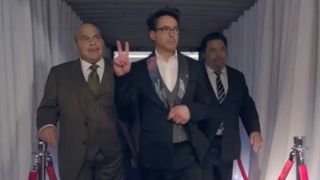 HTC committed to its "here's to change" ad campaign today by debuting its first full-length ad starring Iron Man himself, Mr. Robert Downey, Jr. The ad, in which RDJ attends a board meeting and explores the various meaning of the acronym "HTC," was teased earlier this month with a short clip. Contrary to popular belief, the ad has nothing to do with the rumored HTC One Max, instead focusing on the company's overall brand, and poking fun at said brand. Apparently, HTC stands for whatever you want it to - including "humongous tinfoil catamaran," "hipster troll carwash," "hot tea catapult," "Hungarian tuba concert," "hot tempered cheerleaders," "hog-tied clown," and finally, "happy telephone company." Acronym enthusiasts and the easily amused can get more with the company's acronym generator. What fun! We can't afford Robert Downey, Jr., but we do have a lot more blips to read! How famous do you have to be to get Facebook's new VIP app?